I knew it was coming. 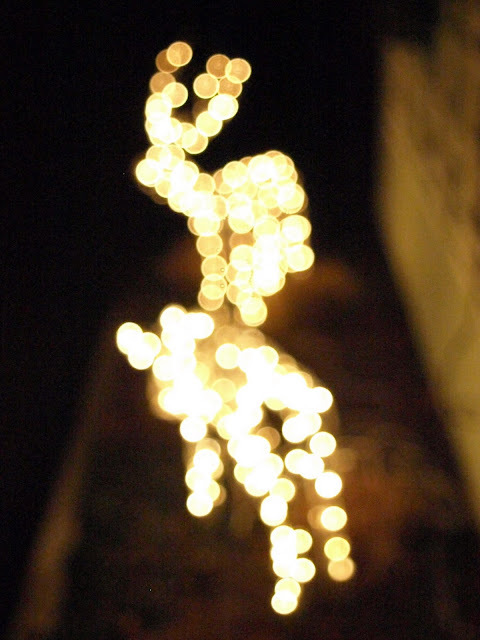 How can you not have the "season of lights" and not try out bokeh? "bokeh is a Japanese word meaning blur or haze that is best described at Wikipedia as “the way the lens renders out of focus points of light”. There is soft and creamy, dreamy bokeh and there is the bokeh where lights translate as circles or circle-like shapes." With the girls snug in their beds (and Nick still in Japan) I buddled up to go out into the freezing front yard. I didn't make it past the front step. (It's 32 degrees and windy out there!) I tried though. Hmm... reindeer? Well, the bokeh is definitely there... but the shapes are far from cheery and festive. The one with antlers is alright... but the other one? She looks like she's dying or something. Next. Also achieved some bokeh. Top lights in focus... fence lights bokeh. This just made me think we need more Christmas lights outside. Or that our neighbors need more lights for me to take photos of. Perhaps I can suggest they all put up some colored lights? I couldnt' take the cold so I headed inside to our Christmas tree. Buzz was hangin' around... so he thought he'd help me out a little with my focus. Or, uh... lack of focus??? I'm still not sure. (Angella's Little Snow Person was a much cuter model.) I do have to say... I was getting closer to what I was picturing. I still feel like I've got to do a lot more playing around. Tracey did say it would take practice with focal lengths, points of focus, aperture and shutter speeds. I absolutely agree with that. It will take A LOT of time and practice to be able to perfect bokeh. I think I'm getting there though. I actually took photos of bokeh on purpose! What do you think? Do you like bokeh shots? Dreamy and pretty? Or strange and just out of focus?